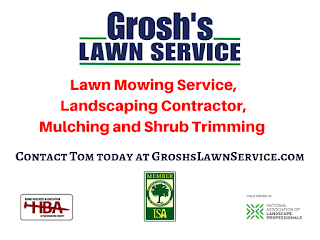 Lawn Mowing Service, Landscape Design Build Contractor, Shrub Trimming, Bed Edging, Mulching, Lawn Care Treatments, Brush Cutting, Brush Removal Contact Tom today at GroshsLawnService.com to schedule your landscaping services and lawn care services consultation. Take time now to Sign Up for our E-Newsletter Grosh's Grass Gazette https://www.groshslawnservice.com/newsletter for landscaping service and lawn care service tips and information. Keeping your landscaping beds and flower beds looking beautiful, bright and weed free is a monthly service performed by Grosh’s Lawn Service for many of our residential, commercial office, church grounds, government facilities and commercial property clients. We offer landscape bed maintenance to our clients all season long. From mid-April to November depending on the weather and temperatures. 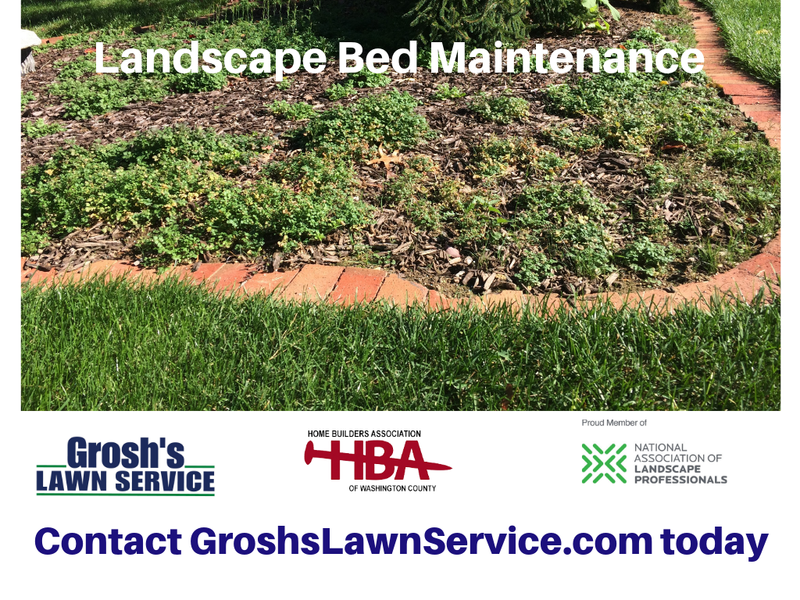 If you do not have time for this chore due to your busy schedule, give serious consideration to having Grosh’s Lawn Service tackle the landscape bed maintenance each month. The key to keeping weeds out of your landscape beds and flower beds begins with proper mulching for the landscape beds that use mulch. Weed seeds can germinate even on top of landscape fabric with landscape stones so you still will need weed control services. Being proactive we keep the weeds from going to seed creating an even worse weed problem down the road. We take the time to check the curbs and sidewalks to kill any unwanted weeds and wild trees growing in the cracks. We also remove all dead perennials that have bloomed and died off when we are at our residential clients homes, office, church grounds, government facilities and commercial properties each month. We will deadhead the annual flowers, perennial flowers and roses so that the plants will rebloom extending the beautiful color longer throughout the season. We also remove all down tree branches and trash that may have blown in. If we find broken or damaged tree and shrub branches we remove the damaged limb(s) to protect the health of the plant. We also keep a watch for any insect and pest damage so that we can be proactive and stop the insect damage or disease. We caution against planting groundcovers for just weed control because overtime the ground cover will also need to be weeded monthly. Pulling of weeds only works for a short period of time as most weeds regenerate new growth and this leads to a reoccurring weed issue. One year of weeds going to seed equals seven years of pain. Contact Tom today to schedule your landscape bed maintenance consultation. These are the Benefits of Landscape Bed Maintenance for your home, office, church grounds, government facilities, nonprofit and commercial properties here in the Hagerstown MD area and Washington County Maryland with Grosh’s Lawn Service. Grosh's Lawn Service Tip of the Week! Copyright © 2019 Grosh's Lawn Service, All rights reserved.. Picture Window theme. Powered by Blogger.